Eric Posner has spilled a lot of ink arguing that we are in the “twilight of human rights law”, using evidence of the vast number of human rights guaranteed in international standards compared to abysmal rates of compliance and enforcement in many countries. While much of Posner’s critique is on target, especially his observation that international organizations are ill-equipped and states are uninterested in enforcing human rights around the world, his conclusion—that international human rights law is thus useless—is neither logically compelling nor supported by the evidence that Posner himself presents. Posner’s complaints about how international law and institutions work are well taken, but he never really confronts the question: compared to what? Treaties are vague, but so are constitutions. International oversight committees fail to enforce actionable obligations, but it seems that Posner would be absolutely horrified if they did. Contrary to the conclusion in Posner’s recent book that “the actual impact [of the ICC and international criminal law] on governments is…unclear”, recent research suggests the opposite may in fact be the case. As ratification of the ICC statutes spreads and the Office of the Prosecutor signals its resolve by commencing investigations, indicting alleged wrongdoers and issuing warrants, episodes of intentional civilian killing by government agents (and to a lesser extent even some rebel groups) has in fact noticeably declined. One can completely agree that the UN Human Rights Commission/Council has been—and maybe still is—stuffed with bad eggs, but this criticism misses the central explanation for how international human rights become relevant. When we look at torture as an example, it may appear as though international laws against torture have had little effect. But as Kathryn Sikkink and Ann Marie Clarke point out, raw torture data do not account for either better information (the more you know, the worse things look) or changing norms over time (what counts as torture in 2015 might not have even been mentioned in State Department reports on which the data are based for 1975). This means this measure almost certainly underestimates the influence of norms as codified in international human rights treaties. Posner’s silence on the most plausible alternative to external enforcement—domestic pressure—is deafening. He dismisses the idea that treaties may be useful tools in domestic political contestations. But can locals make their own demands and move their own governments without any normative assistance from international law? Sure, sometimes, where governments are responsive. In other cases, Posner is correct that waving a treaty around will not make any difference, since there is no reason to think that repressive governments will respond to appeals to the rule of law. But this leaves a whole range of states where governments will concede only when they are convinced or pressured to do so. In Chile, for example, the ICCPR was a focal point for opposition to the Pinochet regime—and the Convention Against Torture (CAT), ironically, was responsible for the UK House of Lords ruling that Pinochet could be extradited to Spain a decade later. 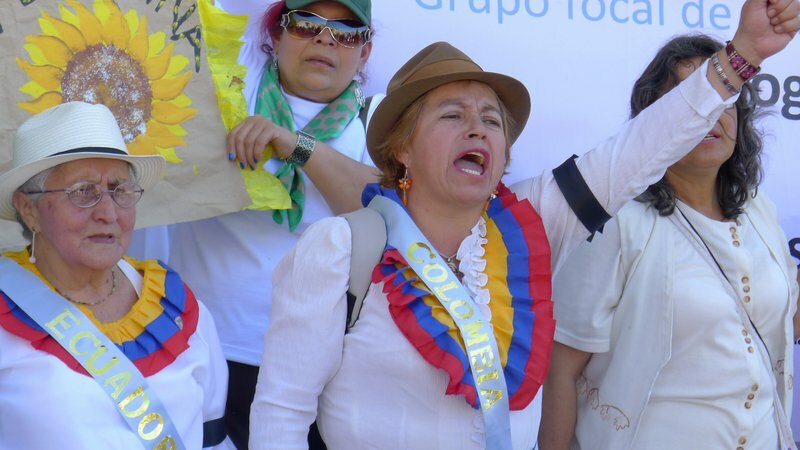 In Colombia, women’s groups used the Convention on the Elimination of Discrimination against Women (CEDAW) to convince government and society to reprioritize women’s issues such as reproductive health care. Treaties add pressure because they suggest new ways for individuals to view their relationship with their government and with each other. A women's rights demonstration in Bogota. "In Colombia, women’s groups used the Convention on the Elimination of Discrimination against Women (CEDAW) to convince government and society to reprioritize women’s issues." Domestic actors often demand treaty ratification precisely because they believe it may strengthen their cause in domestic debates. Women in Japan have used CEDAW, for example, to improve their rights to employment. Children’s advocates in Ghana aren’t likely to see much external intervention on behalf of rights, but they have cited the Convention on the Rights of the Child to argue the case to their government for making basic child health care a higher priority. Israeli pro-rights groups have leaned on international standards and the CAT to make the case for change in detention practices. Certainly, these kinds of claims can stimulate counter-reactions and conservative opposition. There is nothing inevitable about the triumph of treaty commitments over domestic practices, any more than it is inevitable that all rights appeals will prove irresistible. On balance, however, ratified treaties provide a political opening for rights demanders that would be much smaller in their absence. By fixating on external enforcement, Posner misses the critical role that treaties have played in the politics of human rights improvements at home. But it’s not just lack of external will to enforce international law that’s the problem, says Posner. States don’t comply with their human rights obligations because they can’t. And they can’t because governments are supposedly overwhelmed by their wildly proliferating obligations. But this argument is misleading because it doesn’t pay attention to the ample overlap, elaboration or mutual reinforcement. For example, in Posner’s book each criterion for a fair trial is detailed as a separate right. The right not to be tortured is listed as distinct from the right to complain about it. Principles of non-discrimination are triple counted across mutually reinforcing treaties. This whole counting exercise runs counter to the way law really works. Human rights obligations are useful tools for a populace to demand more attention to basic human rights and needs than the state may be currently devoting. The point is this: human rights obligations are useful tools for a populace to demand more attention to basic human rights and needs than the state may be currently devoting. Posner insists that rights are on a fixed budget and advocates will have to fight it out among themselves for funding. But if there is any way to strengthen domestic demands for more humanely targeted resources, international treaties could help—and certainly cannot hurt—in making the case. Reflection on the matter of how rights enforcement is funded leads to a much different conclusion than Posner’s. Investment in one “rights sector”, for example, can be considered a sunk cost with positive externalities elsewhere. If a state spends money to implement fair trials under the ICCPR, then it has invested in a justice infrastructure that supports rights under the CERD and the CEDAW as well. If a government spends money on transportation to get children to school to fulfill its obligations under the Convention on the Rights of the Child, then it is only a marginal cost to let girls get on the bus as well, in compliance with CEDAW. Many “costs” in developing a system that respects human rights are not “unit”-based (because one investment may service many people) and are not even rights-based (the capacity to investigate torture may facilitate the investigation of a wide range of unlawful detentions). Counting rights and thinking additively, rather than in terms of positive spillovers, leads to misguided conclusions. Are rights “no better respected” than they were in the 1800s? The 1930s? The1960s? Are we at the twilight because “good” states like the United States, Canada, Australia, New Zealand, and most European countries are “far from perfect from a human rights perspective”? “Not perfect” is hardly a damning criticism of law’s effects, at any time or place. Also, we must press for counterfactuals. What are we missing in this account? High noon may appear as twilight if we refuse to remove our dark glasses. This article is an excerpt of a longer review published in Democracy.